Brabyn.com: Headache? Get it checked out. Headache? Get it checked out. If you have a persistent headache, I recommend you get it checked. One month ago I visited my GP with what another GP had diagnosed as sinusitis. It had persisted longer than I expected. My GP asked me a couple of questions, then asked me to walk a few paces. Finally he asked me to sit down while he called Charing Cross Hospital and requested a CT scan and an ambulance. 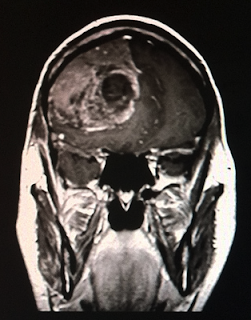 If the tumour had remained undetected for another 10 days, the surgeons reckoned I would have died. They didn't wait: after a further scan to include some reference markers, they cut a 36 cm incision over the top of my head, exposed the skull and removed a large panel of bone over my right eye. They removed the tumour and sent it for tests. It turned out to be a benign meningioma - the best news I could have had. I'm still amazed that I'm alive. 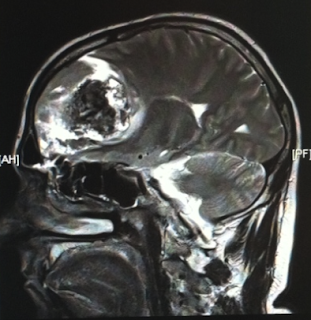 My recovery is going exceptionally well, and I'm deeply grateful to the GP who diagnosed me (who would expect to see this kind of symptom only once every 5-10 years) and to the team of experts at Charing Cross who somehow removed the tumour without damaging my brain. My wife, mother and sisters especially endured a tense time when the prognosis was very much less encouraging. And I'm very grateful to my family and friends who have been great sources of support. I've been very moved by the generosity of friends from far and wide who have got in touch with all sorts of offers of help. It's been a great opportunity to witness the breadth and depth of people's kindness. I've had a very lucky reprieve. If you have any doubts about a persistent headache, get checked out. If you are unfortunate enough to have a tumour, I hope that you enjoy the same good fortune as me. Ben, shocking news. Glad to hear the prognosis is good. Wish you a speedy recovery. Crikey what a shocking story. I am pleased to hear that the worst is over and that you are recovering well.